14 of us met on a lovely late spring day at Carolyn’s home apiary in Fringford. We started as usual by sitting in a ring and introducing ourselves, our experience and where we live – this latter helps people link up with near neighbours. There were several people present who had training or experience in conventional beekeeping but wanted to learn about a more balanced natural no-treatment approach, and had never met natural beekeepers before, and later people took the opportunity to quiz them. We inspected the occupied Warré, had a general Q&A session and discussed swarms. Carolyn has two Warrés, we gathered round the occupied one. Shortly we noticed bees hovering round the entrance of the other, like swarm scouts. Richard figured it out first – these were simply returning foragers who couldn’t see their home hive behind the screen of humans, so had gone to the only one visible in approximately the right place. Shortly thereafter some foragers figured it out and began fanning their “we’re over here!” pheromone at the entrance of the correct hive. After recording our entrance observations (nothing untoward, pollen being carried in etc) we raised the top box of the occupied hive and peered at the bees and the base of the combs. Top box lifted back showing honey stores above, new comb building below – and no drones. This top box had some weight to it so we judged the bees had sufficient stores as we are at “peak blossom” right now – no lack of forage. We made some more notes and took some photos – emphasizing to the new beekeepers how records are an invaluable learning tool and always useful for later diagnostics of any problems. The bees had begun building new comb below this and we lifted out a couple and examined these, seeing nothing untoward. We used a goose feather to herd bees back into the hive, and a light water spray to drive them down so we wouldn’t squash any as we lowered the box down. You can use a smoker for this too. Deadout cause? Marie had high resolution pictures of a dead hive from last Autumn and asked what had caused it to die. Gino pointed out mouse droppings in the floor debris and how one comb had an oval section chewed out of its centre, which looked like a mouse eating larvae. However further review of the case led us to think the die-out was caused by something else, perhaps queen failure, and the mouse damage probably happened after the hive had already died or been weakened by something else, as it is normally too dangerous for mice to enter a colony until it goes dormant (clusters) for winter. White grubs at hive entrance? Margaret reported finding some odd grubs outside her hive entrance. We assumed these were wax moth larvae but two of us later went round to her apiary and realised they were actually drone larvae, whose eyes were still white. It was possible her colony sensed a problem like varroa in their cells and ejected them before they could emerge, i.e. good hygienic behaviour. Alternatively perhaps these had become chilled and died in their cells – we had just had a period of quite cold days and nights following a couple of weeks of good weather – the colony could have had to recluster away from the comb edges leaving the brood there to chill and die. Octagonal Warré? Talking of cold problems, Liz has been wondering whether to block off the corners of her Warrés to make the inside cavity octagonal. This is a modification used in places like Canada where the winters are extreme and corners become cold spots. It is not usually considered necessary in the milder climate of the UK – although occasional cold problems can occur as illustrated above. BBKA? Someone then revealed that they were under the mistaken impression that we and other natural beekeeping groups are associated with the BBKA (British Bee Keepers Association). Just to be clear, no natural beekeeping group is associated with the BBKA, as its training emphasizes intensive management practises like queen wing clipping, swarm suppression, use of chemical mite treatments etc; it is pretty inflexible about this and it has a history of dismissing other approaches. Hopefully this will change over time. 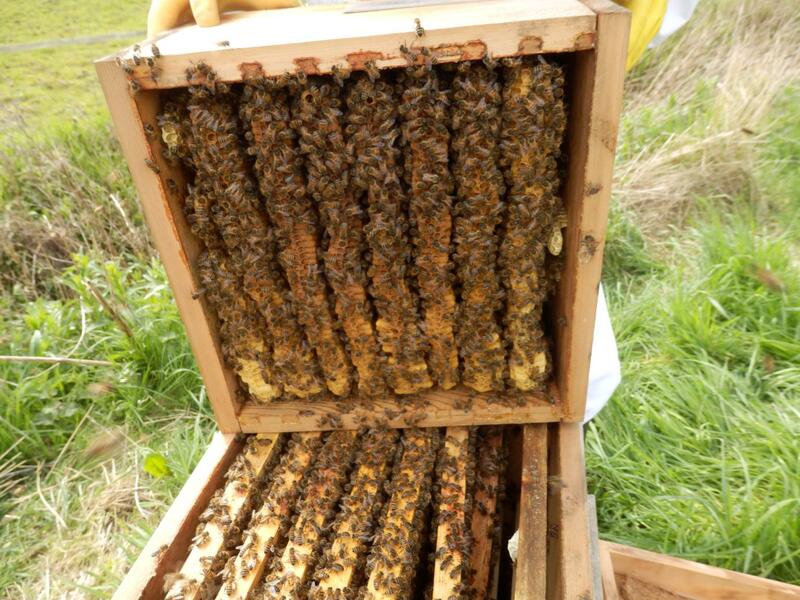 However, in Oxfordshire, our county BKA (OBKA), is much more open minded and flexible, some of their conventional beekeepers are nearer our own approach on the spectrum of beekeeping, no longer using miticides and being more relaxed about allowing their bees to express natural behaviour like swarming. Many of our own members join OBKA to gain a wider range of contacts and experience. The meeting coincided with the start of the much-delayed swarm season for Oxfordshire – it’s slow and about a month late this year due to unusual weather knocking back the development of many pollinators all over the country. During the introductions Ann W mentioned how a huge prime swarm had recently emerged from one of her hives, and Ann & Peter F had a phone call to tell them one of their hives had just swarmed. The discussion turned to swarm behaviour, swarm catching and hiving – and the possibility of queen failure. Swarming is the natural method of reproduction for the honey bee colony superorganism. Bees emerge from a hive in a swirling cloud, then settle for a while as a cluster as they scout for a new home, which can take anything from a couple of hours to a few days. Once they have decided where to live next, they fly there as another massive cloud of bees. Because they may move on very quickly, it is important to go get a swarm as soon as you hear of it. I once lost one because I paused for a sandwich before leaving the house. A strong colony can throw out multiple swarms in one year – last year we collected 4 big casts from one feral colony in a farmhouse roof, and we know another beekeeper got the original prime swarm. The first, prime swarm to emerge from a hive is usually a “classic” swarm – one big cluster of bees hanging conveniently from a branch and acting as one cohesive unit. They have one, fully mature fertilised queen who smells strongly of queen pheromone – they will follow her as a unit. If subsequent casts are going to emerge from the same hive, it tends to happen 9-10 days after the prime swarm, weather permitting, and has a newly hatched virgin queen who has yet to undertake a mating flight. Her pheromones are less strong, and the number of bees tends to be less. Swarming can be triggered by a number of things, one of which is crowding the space available for brood rearing in the hive. So we went over comb management in Top Bar Hives and how unless you move honeycomb bars away from the nest to create space for new brood comb, the colony will feel crowded and swarm early and repeatedly such that it can overly weaken the original colony. Gino remarked that a comb of ivy honey, which sets hard, is particularly effective at incentivising swarming as it acts like an impassable follower board. In a Warré hive, you add room for nest (brood) expansion by adding empty boxes below the others. Some colonies are naturally “swarmier” than others, it is partly a genetic trait. Italian bees tend to build up one big colony whilst bees bred for heath beekeeping in skeps are deliberately selected to swarm a lot. We demonstrated how to use ventilated cardboard boxes to collect bees, and Gino displayed a small laundry basket (like a lidded skep!) he uses which they can breathe through. Sometimes it is simplest to let them run up into a box held above them, sometimes one has to cut a branch, or dislodge a cluster on a branch into a box below by knocking and shaking the branch. 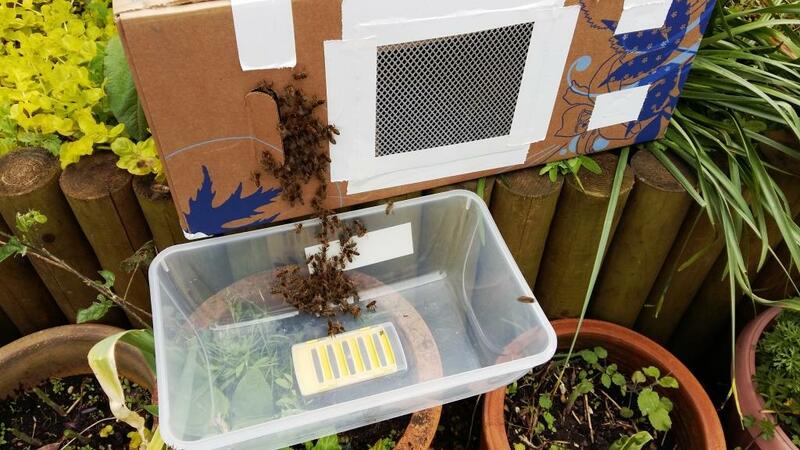 A swarm on a wall can be gently moved into a box with a soft brush like a goose feather. It usually only takes minutes to box the bulk of the swarm, but you may wish to hang round a while to accumulate stragglers, who will be attracted to the box smelling of their queen. Swarms are pretty passive and just want to cluster round the queen. Swarms have no young or stores to defend, so they are not inclined to sting you, even when knocked into a box, but occasionally you come across particularly defensive ones so it is always best to suit up before handling them. Prime swarms tend to be straightforward – they settle in one clump and once hived, tend to stay there. Casts can be more problematic. Young queens don’t smell as strongly of queen pheromone, which can make the swarm less cohesive, and occasionally if a colony has produced lots of new queens, two virgin queens will set off together and the cast settles in two clusters. It can be tricky to collect all the bees in such a swarm because it is not clear to you or the bees that “the queen” is in the collection box. Tanging the bees, or ringing two pieces of metal together, is meant to cause the bees to settle sooner, and may help drive awkward ones into a collection box (anecdotes disagree on this). There are two techniques for transferring bees from the box to the hive. In either case, if the bees have been travelling in a car beforehand, they will need at least a couple of hours in a cool calm place before hiving – if you attempt to hive them when they are agitated they will just abscond. Quick method – You can simply turn the catching box upside down over the top of an open hive, give the box a sharp knock, and the bees fall down into the hive – then close the hive, leaving the open box with any remaining bees exposed to light and next to the hive entrance. Providing you get the queen into the hive this way, which should happen as she will be in the centre of the bees, this usually works fine if done in the early evening (unless the hive smells bad to the bees, which sometimes happens with very new hives which smell of fresh cut wood). The workers then appear at the hive entrance and fan “come hither” pheromone into the air – you can see them stick their bums in the air and fan their wings in rows at the entrance. This calls any stragglers into the hive. If you use this technique when the bees are still agitated from travelling or if there are plenty of hours of sunny daylight left, you may sometimes find the bees exit the hive and reform the swarm closeby. Slower more secure method – Alternatively, you can walk the bees into the hive up a ramp – emptying the bees from the catching box onto a white sheet which is laid partly on the ground and partly on a ramp leading up to the hive entrance – the bees are inclined to move upwards towards the dark entrance. Some people say this is better because the bees actively choose to go in, and there is no chance of the queen falling outside of the hive. In my experience it can take quite a long time and you need to be careful with the sheet – the sheet may fall off the hive ramp, it has to be secured properly. The bees can crowd and block the entrance in a confused traffic jam, but a gentle sweep with a goose feather helps. Bees can also get stuck in folds of cloth and don’t move on, so keep the sheet smooth. Also, it can take a long time, so if the weather is turning wet or cold it is not a good idea. It is quite a spectacle to watch when it works well. Personally I usually hive in the evening and so tend not to always use this technique, preferring to get the majority (and queen) into the hive securely in one main mass. Gino related that in his experience casts are more likely to abscond than prime swarms, and advised leaving them sealed in a ventilated box (the collection box or their hive) for 24-36 hours after capture so that they use up more of the 3-5 days’ fuel (honey) they ate before swarming, and are more committed to the hive – they no longer have the option of moving. However, others recommended hiving them at least within a day so that they don’t ‘commit’ to a box that they are not going to live in and subsequently have little ability left to make new comb once hived – causing its own problems. As usual, ask two beekeepers for an opinion and you will get three answers! The prime swarm has the old, mated queen. These are generally large swarms with plenty of workers and the queen can begin laying immediately – they will build comb and raise young at a prodigious rate, and are sometimes large enough to swarm again the same year. Subsequent “afterswarms” or casts contain virgin queens, and are considered less desirable because they are generally smaller, and there is a chance the virgin queen will either fail to mate successfully, or not return from her mating flight (get lost or eaten). An extra worry for virgin queens in some areas of Oxfordshire right now is an unusual shortage of drones to mate with this year, in some hives, though people in neighbouring counties seem to have no shortage. Many thanks to all who came and especially Carolyn for her time and trouble hosting the event, and to her son Richard for making such delicious cake! This entry was posted in Apiary visits, Inspections, Meetings, ONBG, Swarms, Warré and tagged Apiary visits, Inspections, Meetings, ONBG, Swarms, Warré. Bookmark the permalink.